Glass Recycling in the tri-state area : Glass Cycle Systems, Inc.
"Recycling Saves" * Help Your Environment * Everybody benefits! Glass Cycle Systems, Inc. is the only company with a unique and practical system to remove and recycle your empty bottles. Our efficiently designed glass crusher granulates bottles INSTANTLY as they come off your bar. 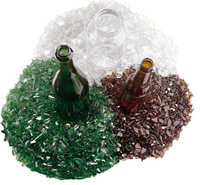 We supply the equipment and containers needed for you to recycle your glass bottles. We also maintain the glass crusher equipment . We COME TO YOU to pick up your glass. This compact machine fits easily under the bar and is safe, quiet and easy to use. CLICK HERE TO START RECYCLING YOUR Bottles / Glass! Why would you need Glass Cycle Systems??? ?